BRAND NEW! 1h 15m course material + 2 optional case studies. You make decisions all day long. Some are simple. Coffee or herbal tea? Buy that new shirt or not? Other times you must make a choice with lasting implications for your future: should you go back to school? Take that job? Marry that person? Go into business for yourself? Decisions both big and small can leave you feeling stuck in circles, like a hamster on a wheel. You second guess yourself, and you’re worried you'll make the wrong decision before you even start — or worse, that you’ll make a decision that could lead to failure. How can you ensure you’re making the best possible choice every time? I teach entrepreneurs and executives how to make consistently better personal and business decisions, supported by decision theory rooted in psychology and behavioural science. Good decision-making is a habit you can develop that will have a positive domino effect on the rest of your life. 4 common causes of decision-making failure you want to avoid because they actually keep you from making consistently good decisions. My 4-step decision-making process ABCDecisions™ to avoid these common errors and employ a systematic approach instead. 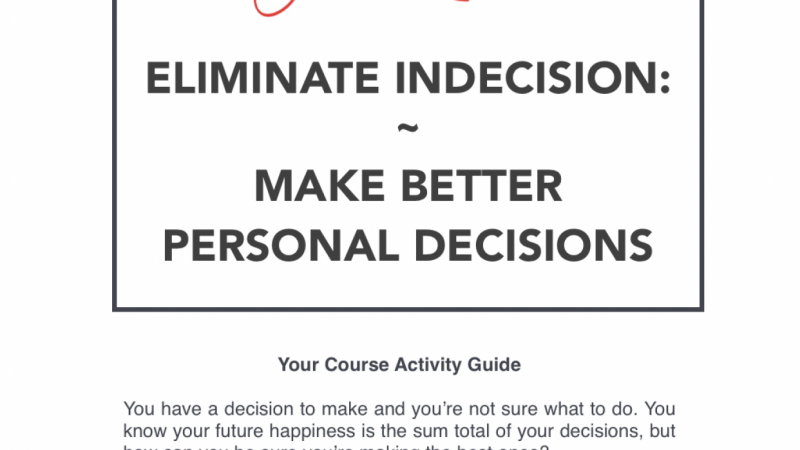 Real-life decision challenges that bring the course material to life so you can be sure you know how to apply ABCDecisions™ from here on out. Great decision making is a skill, that once you develop, will ensure you get more out of your life from now on. Ready to make a great decision? One your future you will thank you for? ABCDecisions™ is a trademark owned by Jill McAbe. The goal with this class is that you learn AND apply this knowledge right away so you can start making better decisions from today forward. I am a Success-Skills Educator and Speaker. I am a Schulich Business School Executive Education Faculty Member, a private consultant and coach to established entrepreneurial businesses, and a Top Teacher here on Skillshare.